Remember when the New Yorker published a story about the last show of Paul Simon’s “farewell” tour last year? It was called “Feeling Lost With Paul Simon One More Time,” and it read a bit like a eulogy for Simon’s career. It was a touching piece. But since its publication, and the conclusion of that tour, it feels like we’re seeing more of Paul Simon than ever (not that I’m complaining). He appeared on Saturday Night Live at the end of last year. and will be headlining the San Francisco festival Outside Lands this summer. He also performed and gave an interview on The Late Show with Stephen Colbert in January. And now it’s April, and Simon is already back on Colbert. This year, it seems to be designed as a personal treat for noted Simon fan Colbert, who performed the uptempo, Cajun-inflected Graceland classic “That Was Your Mother” alongside his hero. 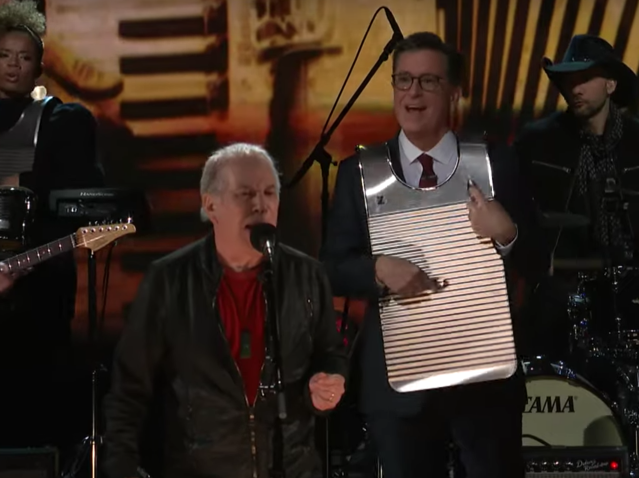 Joining in with Jon Baptiste and Stay Human, Colbert strummed vigorously on a washboard draped around his neck. Simon cut a bit of a rug between verses, and seemed to be having a great time. Enjoy the performance, which is really quite fun, below.